The humidity is suffocating. It's like breathing a hot milkshake. 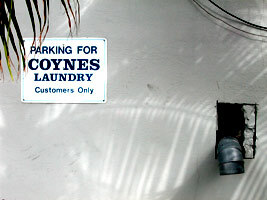 The line of dryer vents is not helping either, as they churn out hot air onto me as I sit on a creaky park bench in front of Coynes Laundry. My wife is inside dealing with eleven days of clothes and I'm keeping the bench down, staring across the hot four lanes of US-1, halfway between Miami and Key West, where we're headed for a 2 day break from Winnie and the Poets. Her: I don't think I can stay here if it's going to be this hot. After that dies down, my wife spots a guy staggering alongside the highway. He's got a buzz cut, wearing jeans and a denim shirt and is lurching down the southbound shoulder while cars shoot past him. It's clear he's drunk. My wife taps me to get me to watch, and as soon as I look over at him he piles head first to the ground, rolling halfway over into the gravel shoulder just feet away from the paved surface. In less than a minute a red pickup truck pulls off the road and a guy gets out and goes over to help. The drunk wants nothing to do with it. He's up again, staggering toward a convenience store while the samaritan walks alongside. Finally the drunk goes down again, and this time it's for good. 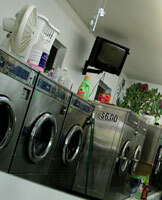 Two of the ladies doing their laundry come out and look across with us. "Is that Mike?" one of them says, and then she walks toward the road, sort of eyeing the scene. The owner of the laundromat comes out and looks over, then looks at me. "Uh, a guy fell over and it might be Mike," I say. "Oh, no," the owner says. "He just got out of jail last night." We hear sirens. Two cop cars and one ambulance come from different directions. 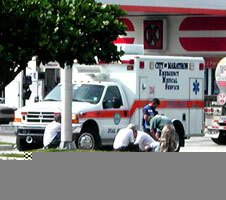 The samaritan turns things over and heads back to his truck. He waves over at us and one of the laundry ladies. She shrugs her shoulders and sort of waves. She doesn't know him. The samartian pulls a u-turn and stops in front of us. He points at the one lady and says, "Hey, when did you get back into town?" The lady is still a little confused, but says, "Last month." "You don't remember me, do ya?" the guy says. We're all standing there sort of playing along. "It's Mikey," the samaritan tries. "Remember? Melon shooters? My brother's got an apartment above the Dive Shop?" "Oh, yeah," the lady says, finally pulling in the signal. She winks at the laundry owner and then sidles over to the guy's truck to reacquaint. He pops his door open and I'm a big fan of his shirt full of pelicans and his neck full of chains. The lady who originally walked away to check out things walks back to all of us. "Yep, it's Mike. It looks like he tied one on last night." "He's a homeless guy who lives under the bridge down there," the owner says. "He comes around here a lot. Another thin guy in jeans and a t-shirt is sort of sneaking up on the ambulance, looking things over, steering clear but trying to see what's up. "That's Mike's buddy," the owner says. "They hang out together. They're good pals." We all stand there a bit longer and the humidity starts to get to me again. My big head is sweaty, beads rolling down onto my nose. Mike gets loaded into the ambulance and a dryer buzzes inside. My wife and I look at each other and we go inside to fold.